We're closing in on honey harvesting time. I did a hive check up yesterday (our first in almost a month) and I was generally a bit disappointed with the progress of our ladies. Not as much honey as I was expecting. This could be due to several reasons: high bee populations combined with a poor nectar flow, queen mortality, but is most likely due to the fact that we had a swarm smack during the middle of nectar season. It killed our productivity. Live and learn, I guess. -I found our Mud Honey queen in the upper deep. She had an excellent egg laying pattern and this hive will shortly have a huge influx of workers. A little too late. Most importantly, it was NOT our green queen. La reina has been replaced! This probably hurt our productivity significantly which was a bummer since I had such high hopes for this hive. We're wondering if perhaps this hive swarmed as well and we just didn't catch it. A few factors are puzzling about that theory though: first off, they have plenty of room; the two supers on top are practically empty. Secondly, our green marked queen had clipped wings, making it difficult for her to fly. So I'm not sure how she would have swarmed. It's possible that she died in the hive and the population suffered significantly in the time it took for the hive to requeen. I guess we'll never know. -Last time we had a bee post, I mentioned how the swarm hive had a very naughty queen. Here's the deal. When you get a hive, you put the bees in one deep and then add an additional deep and honey supers on as the bees need more room. When we collected this swarm from the tree, however, we were worried that the bees would find the one deep box to be too small a cavity and chose to look elsewhere for hive location. Since we didn't have a second deep, we added a honey super. The differences between the two (besides size): the deeps had plasticel foundations, the supers had genuine beeswax foundations. Lesson learned: Bees greatly prefer beeswax foundations and will thumb their noses at the plasticell, if given the opportunity. So our queen started laying her eggs in the shallow super (where the honey is supposed to be stored) rather than in the deeps. Naughty queen! Last time we had placed a queen excluder between the bottom honey super (where the egg laying was occurring) and an upper one, hoping that the bees would start to fill in the top super with honey. We also sprayed down the plasticel, in the hopes that the workers would start to draw out the comb. When I checked yesterday, I observed the queen still holding forth on the bottom super. Bad, bad queen. Having pulled out the frame on which she was located, I gently encouraged (read: pushed) her onto one of the deep foundations. This is a tricky process: hurt/kill your queen with a clumsy finger and you've just set your hive back by weeks. Now that the queen was in the upper deep, I moved the queen excluder down to below the lower super. 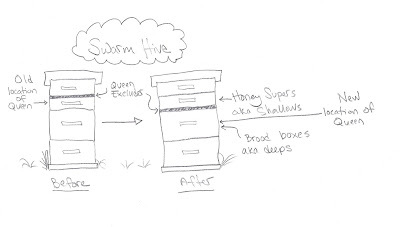 Hopefully our ladies will start filling the supers with honey now that they will no longer be occupied by brood.